Screwfix has launched its latest catalogue featuring Milwaukee exclusives and offering UK tradespeople an exclusive deal to celebrate the launch of the Milwaukee range! 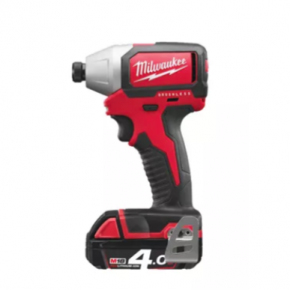 The catalogue will offer an exclusive deal on Milwaukee’s most powerful, compact 18V drill complete with 2 lithium-ion batteries and case, in addition to 20% off all Milwaukee accessories when bought with any Milwaukee power tool during the introductory period. Milwaukee’s popular range of heavy duty products, including the Screwfix exclusive M18V Brushless Combi Drill and M18 Brushless Impact Driver, are ideal for both tradespeople and the serious DIY enthusiast and are recognised for their durability and performance. “Tradespeople can now get their hands on Milwaukee exclusives at our events and in-store, including via our Click &amp; Collect service. Not only is the new Milwaukee range the highlight of our latest catalogue, it will also be a key feature at Screwfix Live in Farnborough at the end of September, so register now and keep an eye on regular updates’’. Exclusive to Screwfix, the 165mm drill has a torque of 60Nm to give the best power to size ratio. The drill is built with a brushless motor to last longer and continually deliver optimum power and unmatched durability. Priced at £199.99 for the Exclusive New Introductory Offer. 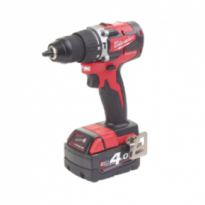 Another exclusive offered by Screwfix is Milwaukee’s compact impact driver. Measuring only 137mm in length with a 99 mm head height, the driver is ideal for overhead applications or working in tight spaces. Milwaukee’s latest impact driver delivers 170 Nm torque and the driver uses Redlink intelligence for temperature management and overload protection to safeguard the tool and battery. Priced at £109.99 (without battery or charger). Hive thermostats control the central heating system using your smartphone. 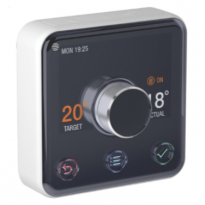 Available in a variety of models such as heating only, heating and hot water and even multi-zone control options. Users can also access temperature graphs to monitor heating usage and efficiency in and around the home. Priced at £134.99. This multipurpose saw from Evolution is ideal for cutting through wood, even if nails are still in the material, aluminium, plastic and mild steel. The trade rated precision saw cuts cleanly and leaves no burrs on steel. 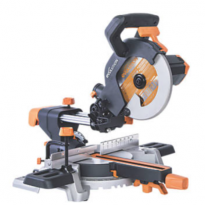 Supplied with a durable die-cast aluminium base to support heavy duty materials and a laser cutting guide to enhance accuracy, this saw features a dual-handle with a comfortable grip allowing for right or left-handed usage. Priced at £99.99. For more information on Screwfix’s range of products, visit the website, or pick up a copy of the new catalogue at a local Screwfix store.